What are the benefits of using a Wet Brush? No matter your hair type, you have to tame your tangles. The Wet Brush is perfect for every hair type and style; its bristles are also long enough to get through the thickest manes. 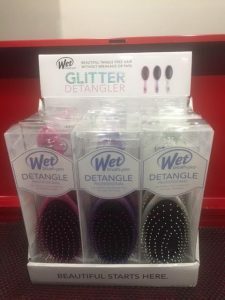 The Wet Brush is designed without regard for age, gender, or nationality: it is the detangling tool for everyone who does not want the pain & snapping that most hair brushes cause. The Wet Brush is also recommended for use with wigs & most extension services because there is no tugging on the hair. The patented Intelliflex Bristles are the secret to the perfection of this product. They are gentle on wet hair, which is more prone to damage. Wet Brushes come in an array of cool patterns, & now they’re available in glitter!